It makes a good deal of sense that many of the skin care products, bragged on by professional models and makeup artists fall well outside the budget range of the average woman. 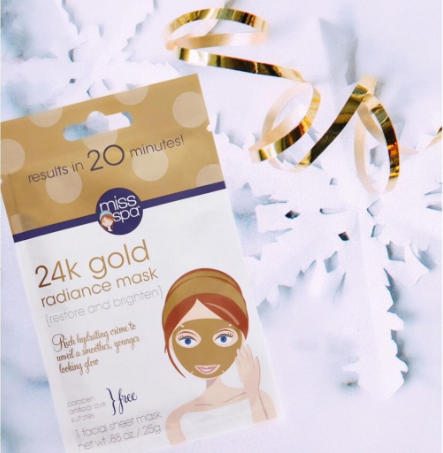 However, you may find yourself in rare luck, because Miss Spa’s 24k Gold Sheet Mask is extremely affordable and boasts many of the same benefits as the popular Victoria’s Secret 24k gold mask, which rakes in around $300 a pop (yeesh). In their latest and most inventive contributions to the sheet mask trend, the people at Miss Spa now offer a 24k gold Radiance Mask at Target for only $4. This is less than a latte or a bodega sandwich or really, most purchases that would bless your face infinitely less. This is the type of mask you wanna pop open a bottle of bubbly for. The three new Miss Spa masks released at Target for 2017 include the 24k Gold Radiance Mask, an Oxygenating Bubble Mask, and a Charcoal Clarifying Mask, all of which only cost $4 a pop! You can score all three for under $15. Now you can live the luxe gold face mask life on a baking soda budget. You can check out all three of the new selections on the Target website, and see if they speak to the latent model inside of you.